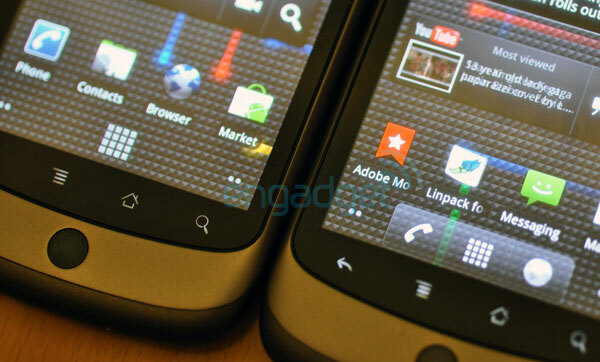 Much to our surprise at the time, when Adobe sent us a Flash 10.1-enabled Nexus One for testing, the phone came preloaded with a preview build of Android 2.2 -- a.k.a. "Froyo" -- the apparent turning point for curbing Android fragmentation due for a very public unveiling today at Google I/O. We've had a day or two to dig into it, and while we're surely missing some improvements here or there (Google was unable to provide us a changelog as of this writing), we've spent pretty much all our waking moments combing through every virtual nook and cranny. So what can Eclair alumni expect from the revised platform? Read on for more! The first thing you'll notice with Froyo is a slightly modified navigation bar that assimilates shortcuts for both the phone and web browser. The Google search bar has undergone a slight modification, too, letting you cater your search specifically to web, apps, or contacts -- and that's about it for home screen modifications. No extra wallpapers, no additional screens, no new shortcuts. 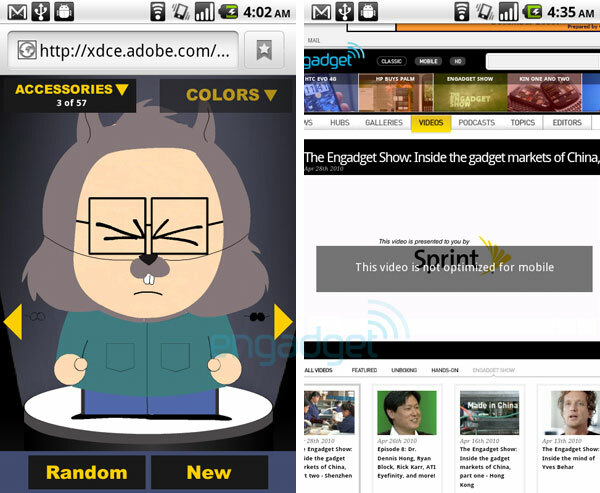 As for new widgets, all we've seen are a tutorial box and a rotating ad for featured marketplace apps. Well, what do you know? Even seeing the settings sub-menu for tethering and portable WiFi hotspot functionality didn't completely convince us, but sure enough, we logged on to AT&T's 3G network without any issues. Security options are limited at this point -- it's WPA2 PSK or bust -- but that should be more than enough when your DSL goes on the fritz or you're stuck in traffic and need to do some heavy emailing. Let's see how long the carriers turn a blind eye on this one. While support for apps on external storage is presumably intended for Froyo (the Manage Applications screen is now divided amongst Downloaded, Running, All, and most importantly, "On SD card"), try as we might, we couldn't find a single program that'd let us use the "Move to SD card" functionality. That includes marketplace and third-party downloads -- we'll have to explore this one later. Camera: Controls are now more streamlined within the viewing window and much easier to sift through. 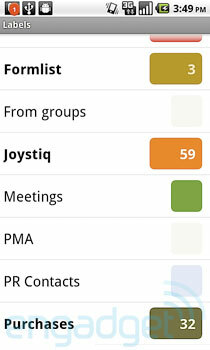 Gmail: Previous and Next navigation in every viewed message, and a much more colorful means of sifting through labels. Calendar: The large green bars that took up much of the calendar space have been thoroughly fine-tuned into blue segments more indicative of the actual hour of day for each event. Voice recognition settings: Does voice search have a perceived issue with your accent or colloquialisms? New options for voice recognition let you choose seven different dialects of English (US, Canada, UK, Australia, New Zealand, India, and Generic), Mandarin Chinese, and Japanese. The latter worked quite well in testing, producing accurate Kanji for our horribly strewn together phrases. Security: Sick of locking your device with a pattern? PIN codes are now accepted. Car dock: A revamped interface spaces out the buttons, adds quick shortcuts to music and lighting adjustment, but decides it's probably for the best to disable the hardware home button in lieu of an easier-to-press "Exit car mode" screen key. We have to say, it's really something to have a mobile browser that doesn't pop up little cubes with question marks all over the web, but we found that rediscovering Flash was much like reuniting with a high school friend; at first you've so much to catch up on, but then you realize how far you've grown apart. Adobe's pre-vetted list of Flash-enabled sites do a good job of showing off the technology, but we still can't help but think the interactive elements still have a lot of catching up to do. As for video, the stream is good quality but gets fairly choppy -- especially when you check out something "not optimized for mobile viewing." 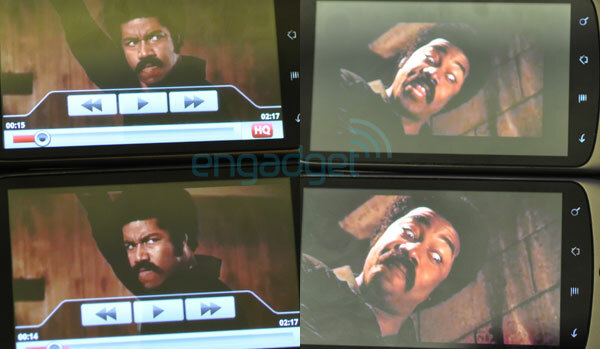 Some of the HTML5 footage we've seen via the same device shows up in crisper detail and fluidity. Battery and heat are also of concern: the pre-release beta we have, according to Adobe, lacks hardware acceleration. Ergo, our beloved handset got piping hot after about 30 minutes of heavy video watching, and the battery indicator in the upper right had a sizable dent. So, does the new system run as silky smooth as earlier hinted at? 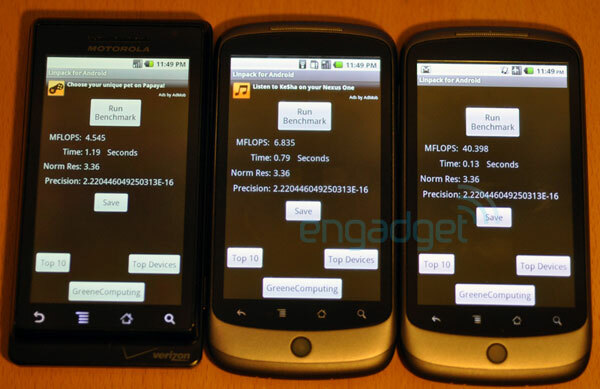 In our tests, we were getting about the same Linpack scores as the early reports, which was over five times higher on Froyo than on Eclair -- and even more dramatic when you compare it with an Eclair-laden Motorola Droid. We saw similar results with a number of other benchmark tools, namely Sunspider and Benchmark Pi (unfortunately NeoCore, our favorite 3D test, kept crashing when we tried it). Of course, numbers are one thing, but how does it feel in practice? Frankly, we haven't seen that dramatic of a performance change. The full Engadget page consistently loaded a few seconds faster on Froyo, as did any other page we tried. Ditto for some of the more hardware-intensive games -- Raging Thunder II, for example. That said, fresh locations on Maps loaded just as fast on both versions, and we were hard pressed to find any other noticeable performance disparity. It's clear to us that, toying with the OS prior to Google's big unveil, we're not getting the whole picture of Froyo. But taking what we have here so far, there's a lot of promise (and certainly a lot of improvements on the backend). 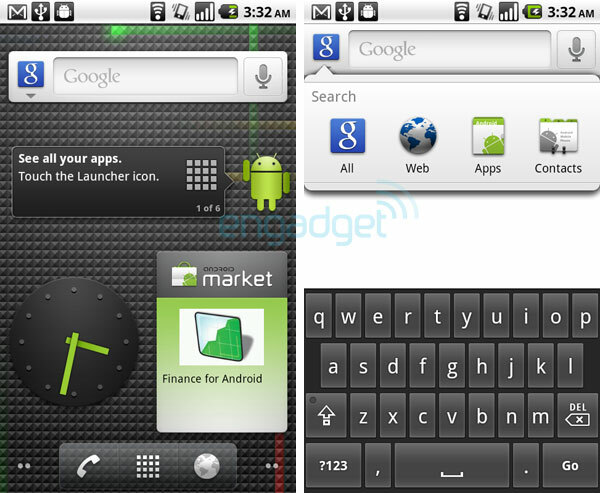 Some of the major aesthetic issues that have plagued Android in the past, however, are still out in full force. There seems to be no cohesive vision on how the platform should look and feel, and first-party apps run the gamut in terms of interface and design. The whizzes at HTC know how to work their magic with Sense UI, but what we'd really like to see is Google come out with an interface that'd prove much less tempting to cover up. Still, the narrative of this Brave New 'Droid is still being written, and this is definitely a step in the right direction.